Register Log In ECN Forum Forums Violation Photo Forum Electrician Moonlighting? Hmmm... Looks like the same sort of set-up as a GC I once knew would use. What's with the color on his leg? Is he wearing some sort of chaps? If that's an angle grinder, it appears to have no guard over the wheel. Notice how the extension cord is wrapped around the scaffolding! Is that a door panel atop the scaffold? Maybe the cord is holding the scaffold up?! Perhaps the scaffold was captured in motion, as it topples on the poor woman by the car. 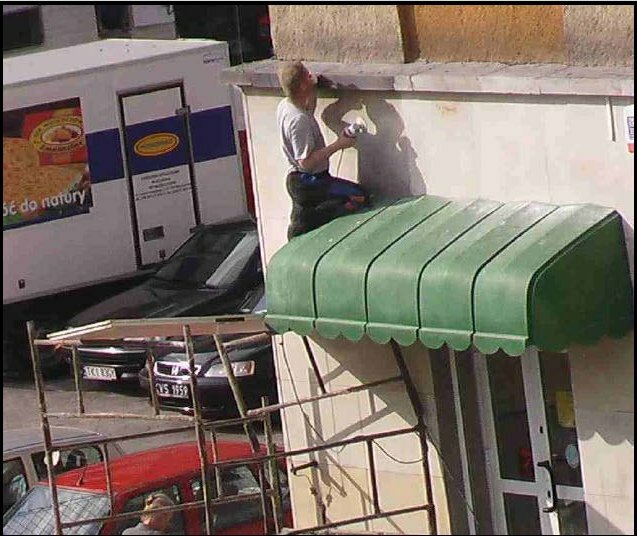 When the scaffold falls, he can just shift the rest of his weight onto the awning!!! Looks like one of those optical illusion drawings where cubes are drawn so the longer you look at it, you can't tell which are protruding, and which are receeding!!! Look very close at the "color" on the leg...he's wearing shorts and a kneepad, while his shin is resting on that metal(?) awning, so when that grinder (with the ground prong cut off, I'd bet)fails, he'll get blown off of the scaffold and into the lady below's waiting arms!! Ahhh, amore! Where was that taken - Portugal? Brazil? Stupid question of the day, please forgive me. Sometimes the guard over the wheel in a grinder gets in the way of the work you're trying to do. What's wrong with removing it as long as you're wearing suitable eye-protection, heavy gloves and long-sleeved rugged pants and shirt? Or is the orientation of these guards adjustable? I've worked with a similar type angle grinder once and it didn't have the guard attached. I'm not being snarky, just curious. I often have use for an angle grinder. The guard is adjustable. I'm no fanatic when it comes to safety glases....the "wear safety glasses" not on screwdrivers strikes me as asinine....but the angle grinder is on time you need to use them. It is also essential that you use the side handle- it's too easy for the thing to jump and get away from you. I'm just wondering what he's doing that's worth all the trouble. Is that corner just a little bit out from 90º.